How competitive is your business? Are you gauged for success? If these are things you've wanted to know, Porter's Five Forces template is the strategy you need. This template is a system that uses five common competitive forces to analyze the weaknesses and strengths within a business. Is your business in line to be profitable? By applying Porter's Five Forces, you can determine just that and figure out what weaknesses you need to overcome to make it happen. It's a tool that helps businesses get on the right path, but how does it work? Porter's Five Forces template has been around since the late ‘70s and has been used by businesses as a key strategic tool since. Its name comes from its creator, Michael Porter, a Harvard Business School professor. While it's not the only tool businesses use to gauge potential for success, it remains one of the most popular and widely used. There are five forces, according to Porter's research, which affect the success of a business. They aren't just forces coming from your competition, but also environmental factors. By determining these five forces, Porter was able to create a method in which businesses could be successful even in competitive fields. 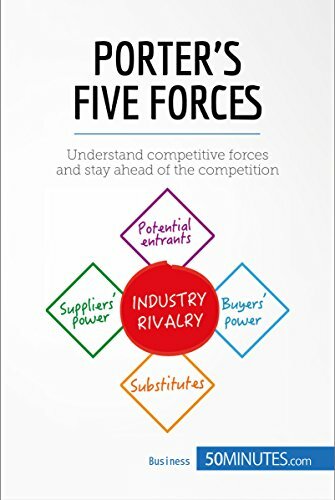 When it comes to Porter's Five Forces template, one of the first things you're going to look at is your competition. How many people are there competing with your business? Are they local competitors, national? Do they offer all the same services and products? How do they differ? Your direct competition may take away your buyers by offering lower prices that you just can't beat. The key is to make sure you're offering something that is different than the competition: better products, better services, etc. A little rivalry can sometimes be a good thing. Your competition isn't the only thing that can affect the chances of you having a successful business. If some of the services you offer clients can be done cheaper by the clients themselves, then your business will be weakened, and you'll lose money. Maybe they found a software download that allows them to do what you normally do for them for half the price. Substitution threats are one of the reasons why it's important to know your services and your industry so that you ensure you're offering services that people need. Even so, competition from clients themselves can often be avoided by offering them more than what any DIY situation can give them, like follow-up services. Is your business in a popular market? Your success could be affected by new businesses coming into the same field as you. Consider how easy it is to break into the market you work in. What can you do to make sure that your business remains an asset to your customers even when new businesses open up? How long your business has been around may be one factor that can help you with your success. An established business that is known for good service will often cssontinue drawing in more customers than a fresh, new business. However, if your customers aren't happy or have started to get bored with what you're offering them, even one new business in the field could have negative effects on your standing. Your supplier has an effect on your business and your success. If demand for the products they offer increases and they raise prices, you'll be paying more. That means you'll need to pass those extra costs on to your clients as well. Consider whether or not it might be time to switch to a new supplier? Is switching cost-effective? Consider how many supplier options you have. The more suppliers there are to choose from, the better chances you have of getting a bargain deal even when the market gets a little pricey. Again, consider your buyers. If you're only catering to a few customers, you'll find that they have more power to dictate what you offer them and for how much. You want to be in a field where you have more customers, which puts you in the control seat. How can you increase your number of clients? Each of these items forces you to look closer at your business, what you offer, and who you're offering it to. Your chances of success rely on many things, including customers and competition. That's what makes Porter's Five Forces template such a valuable business source. Use Porter's to determine if it's time to expand your product line or services. Determine if you need to do something to increase customers or make yourself more noticeable over the new competition coming onto the market.